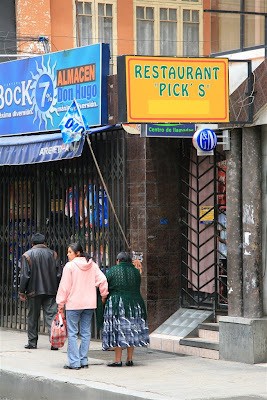 The “Blog” of “Unnecessary” Quotation Marks: "Pick's"
Dion saw this in La Paz, Bolivia, and knows nothing about the restaurant, and whether or not its owner's name/nickname is Pick. That's intriguing and so is the blanked out portion below (which Dion leads me to believe is not photoshopped). I'll be travelling tomorrow, so don't expect updates. In the meantime, consider taking this survey that helps my advertising partner (BlogHerAds) have information to give potential advertisers about demographics and stuff. Incidentally, I have had a great experience with this company, and encourage other bloggers who fit their requirements to join up. That was the worst internet survey I have ever taken.